A WOMAN IN her 30s was brought to hospital after she crashed a car into the front of a house in Tallaght, causing serious damage to the property. The incident happened on the St Aongus Road in Tymon North at around 1.45pm this afternoon. 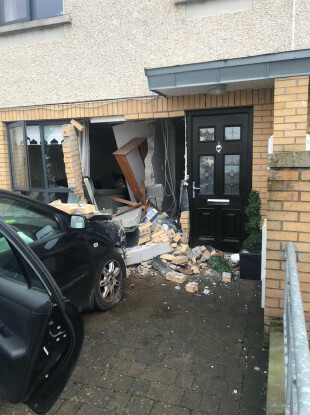 Gardaí were called to the scene after the woman seemingly lost control of the vehicle and rammed the front of the house. The front window and the doorway were seriously damaged. Gardaí confirmed they are investigating the incident. A spokesman said: “Gardai are investigating a traffic incident that occurred at a house in the Saint Aongus Road area of Castletymon on 10/1/19 at approximately 1:45pm. “A car collided with the front of the house causing extensive damage. Driver of car, a woman in her 30s, was taken to hospital as a precaution. No other injuries were sustained in this incident. Investigations are continuing . An earlier version of this story indicated that a man was driving the vehicle at the time of the crash. Gardaí have since amended their statement to say that a woman was in fact driving but the man required hospital treatment as a precaution. Email “Car smashes into front of Dublin house, causing extensive damage”. Feedback on “Car smashes into front of Dublin house, causing extensive damage”.